SEFT is a transdisciplinary art project involving public interaction and dissemination, which explores disused railroads as a starting point for reflection and research on their historical importance, social implications and current context. It deals with two poles of the social experience of technology: usefulness and waste, and the way the ideology of progress marks the outcome of technology over time. SEFT-1 is a vehicle that works as a device for research. 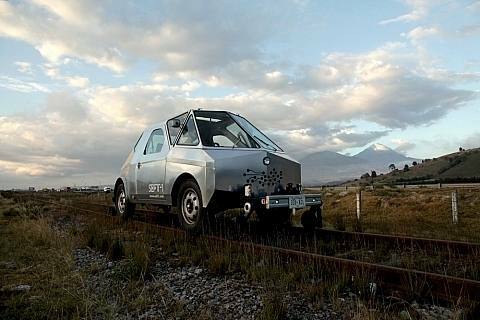 It can travel both on land and on railroad tracks. This exploratory probe engages in a photographic, video, audio and text survey of the things it finds, along with the landscape and infrastructure surrounding railroad routes, while also interviewing people along the way, etc. It uploads that information to its website, where one can monitor the status of the probe, its location, the routes followed using GPS tracking, see images and videos of its journeys and access context information edited by a research team. Using art as a platform, this project interweaves with subjects such as technology, history, anthropology, politics, human geography, education, and environmental sciences, among others. It focuses on a sensitive experiencing of reality as an aesthetic event. It seeks to generate relations and stories among people in rural-urban settings while contributing to an understanding of the complex mechanisms behind the shaping of social structures. It researches the outlines of dependence on technology –and how its characteristics condition certain social processes—while also making use of technology to grasp and share the experience. The Probe has a crew of two. In some of the settlements visited by the Probe, the railnauts present the information gathered on previous journeys to strike up dialogues and act as a shuttle for stories and questions between people and places. During its run, the crew engages in reflective and creative processes regarding the things they encounter, which can take the shape of physical, photographic, sound and other kinds of samples. The SEFT-1 project is an undertaking of the railnauts Iván Puig and Andrés Padilla Domene. In this interview Pablo Domínguez Galbraith talks to them about their launch, journeys and future projects of this vehicle for research and exploration.